Rarely available in unassuming building in Kahala. Single-loaded allows cool breezes, bougainvillea hillside at your front door and peaceful ocean views off your lanai. Great corner location overlooks the pool and directly above covered parking stall and exterior storage locker. Remodeled and upgraded with Merbau floors, granite countertops, fresh paint, pantry, walk-in closet and secretary’s desk. Low number of units achieves balance of quiet privacy and Kahala Mall shopping, dining, hotel amenities, Country Club, freeway access, health and business conveniences at your doorstep. Please, send me more information on this property: MLS# 201910608 – $528,000 – 4970 Kilauea Avenue Unit 601, Honolulu, HI 96816. 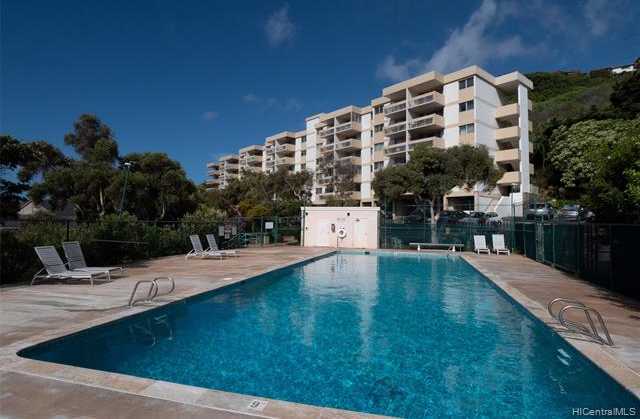 I would like to schedule a private showing for this property: MLS# 201910608 – $528,000 – 4970 Kilauea Avenue Unit 601, Honolulu, HI 96816.